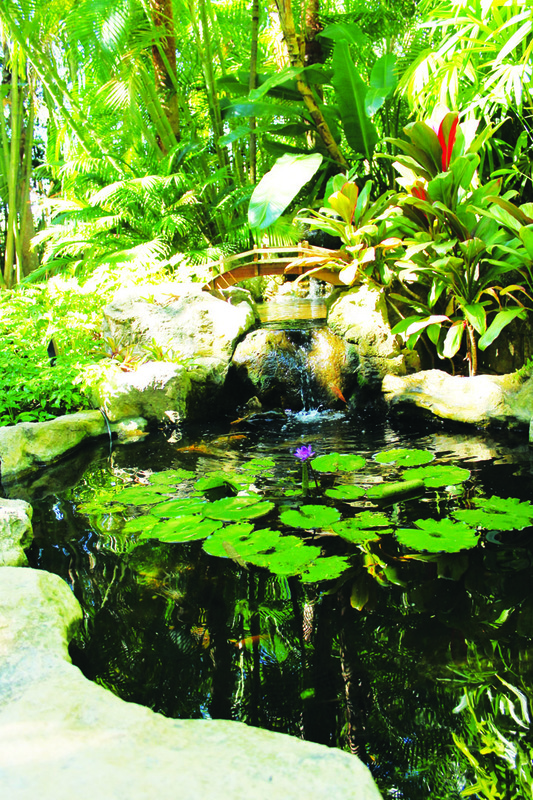 This month we are featuring a recent visit to Sunken Gardens in St. Petersburg. It was the first time we had ever been to the 100 year old garden, but it definitely won’t be our last. We weren’t sure what to expect when we pulled in to the parking lot and entered the visitor center, but when we went out the back door into the garden it was like a whole new world. There are more than 50,000 tropical plants and flowers, as well as waterfalls and ponds. You feel like you are in a secluded forest of fresh air. It is so beautiful. I didn’t even know what half of the plants were that I was looking at so I’d like to go back for a guided tour. Sunken Gardens is filled with beautiful plants and ponds, and visitors can choose which path to follow first. Thankfully they gave us a map at the Visitor Center. One way leads to the Wedding Lawn and Oak Pavilion and another way will take you by the Amphitheatre and Koi Ponds. Not only will you be surrounded by different plants and flowers in the garden, but you will see Flamingos, Laughing Kookaburras, Macaws and Amazon Parrots. 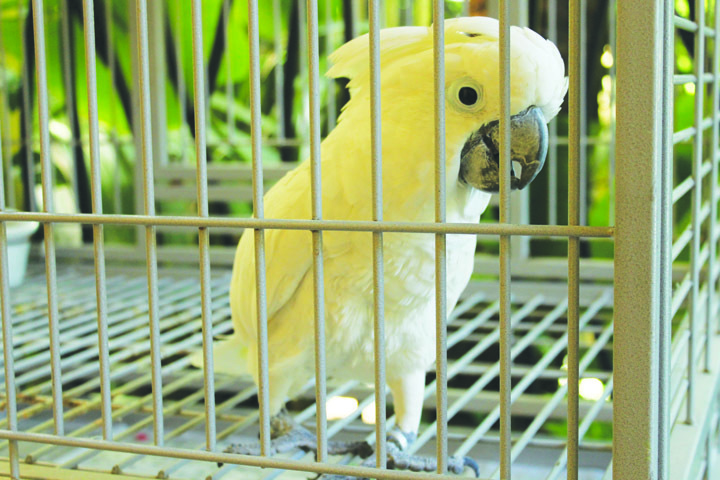 Most of the birds will sing or whistle along with visitors when they stop by to say hi. The white cockatoo was smitten; he said “Hey Baby” when we stopped to chat with him. 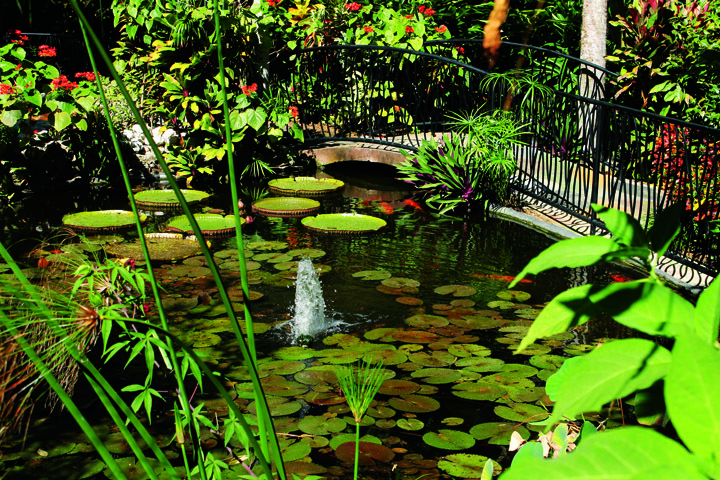 Sunken Gardens is a great destination for families, field trips and even dates. It offers different daily activities, such as morning yoga (ranging between Gentle Beginner, Vinyasa Flow and Open Level Hatha) at 10:30 a.m. and Hoop Dancing on Tuesdays at 10 a.m. There are also yoga and hoop dancing classes offered for kids in the afternoons. Sunken Gardens is also available as a venue for different workshops and events, as well as weddings. I would get married there. I guess I need a fiancé first. It offers guided tours for 15 people or more with a reservation. Sunken Gardens is open Monday through Saturday from 10 a.m.-4:30 p.m. and Sunday from 12 Noon-4:30 p.m. Admission is $8 for adults, $6 for seniors 62 and over and $4 for children ages 2-11. Parking is free and Garden passes are also available which include unlimited free admission or a year, a discount in the gift shop, workshops and other local museums and more. In the Visitor Center there is also a gift shop and the Great Explorations Houghton-Wagman Children’s Museum. Sunken Gardens is located at 1825 4th St. N. in St. Petersburg. For more information, visit www.stpete.org/sunken or call 727-551-3102.